This week, we will cover a topic that brings joy, and tears, and anxiety and hatred and love and…well a whole plethora of emotions: The Wedding Dress. Wedding dresses might very well be the most important element to many brides, but when you’re on a budget, how can you get a dress for less? 1. Buy a used dress- The very thought makes some people cringe, but in all reality, blowing half your wedding budget on a dress you will wear one time in your life for maybe 10 hours is just insane for those of us with a teensy budget. If you’re not super sentimental, buying a dress that has seen another wedding or two is a great way to save costs. 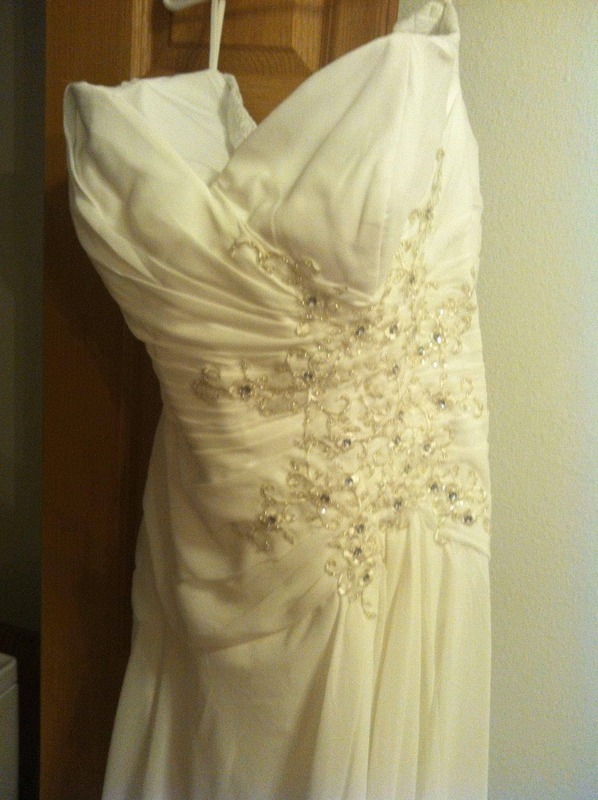 Look on Craigslist, eBay and also check for bridal consignment stores in your area. 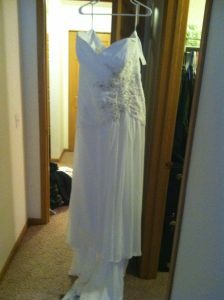 If you live in Minnesota, one that I have found that’s great is Bride To Be Consignment in Burnsville. They have a whole back room filled with gowns in ALL sizes (up to size 28 I believe) and they are in great shape, and current styles. This is also a great way to sell yours when you’re done with it! 2. Borrow a dress- This is tricky, but if you have a close friend or relative willing to lend you their dress, then consider yourself lucky! Just make sure you discuss any alterations before you go forth with them! 3. Buy a “sample” dress- Many bridal boutiques will sell their “sample” dresses (the ones women try on in the shop) at a highly discounted price. If you can get it altered to fit you, you can score some HUGE savings. Just know that many of these dresses are sold as-is and may have imperfections that may or may not be fixable. 4. Buy a plain dress- It’s no secret that the less intricate the design, the cheaper the dress. But if you have a little crafty know-how and some sewing skills (or you know someone who does) you can jazz up a simple dress and make it custom! While you may not have the prowess to craft an entire gown from scratch, you might just be able to embellish a simple gown and turn it into something spectacular. 5. Buy direct from a manufacturer- This is the route I went with. I found a gown in a boutique that I fell in love with. It was “the one”. While the price tag wasn’t too terrible, I knew I could probably find a better price, so before making any deals final, I got the style name and number and went home to do a little research. I found many manufacturers in China that offered the exact same dresses at discounted prices. I used Forever Wedding Gowns and had a good experience. They took a little longer than I was quoted, but in their defense, my order was placed during Chinese New Year, where all factories are closed for two weeks. And the finished product? TOTALLY worth it. Something worth noting: the dress may not be IDENTICAL to the designer version. Mine was very very close but had some minor changes, like a lighter weight fabric for example, but other than that was nearly an exact duplicate. 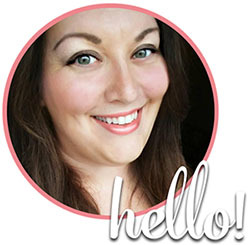 After everything was said and done I got a gorgeous wedding gown…for an unbelievable price. So you see, its VERY close to the original. And what did this dress cost? After all was said and done I paid $290. Including 2 day shipping from China. That being said–there are some horror stories out there of the brides who bought “China dresses” and had terrible experiences. I say if you are going to go this route-make sure you have plenty of time in case something goes wrong. Also, have reasonable expectations. The dress will not be as high quality as you would find in a boutique, but the price reflects that. If you don’t plan on passing down your gown to your daughter (does anyone ever ACTUALLY do that?) then it doesn’t make sense to spend a lot on the dress. Most women get married, and pay huge sums to have their dress “preserved” and then what? It sits in the back of their closet. If you’re like me, the money is better spent somewhere else. So there you have it. What do you think of my “China Wedding Dress”? 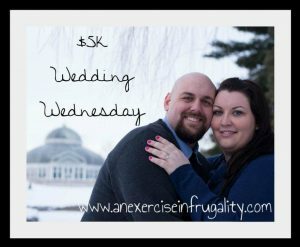 Check out the other $5k Wedding Wednesday posts here! Would you ever buy a “knockoff” wedding gown?